Other genetic markers can be used to help position contigs along the chromosome. When the large-insert clones have been assembled into the correct order on the chromosome, a subset of overlapping clones that efficiently cover the entire chromosome can be chosen for sequencing. 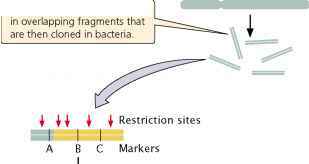 Each of the selected large-insert clones is fractured into smaller overlapping fragments, which are themselves cloned with the use of phages or cosmids (Figure 19.11). These smaller clones (called small-insert clones) are then sequenced. The sequences of the small-insert clones are examined for overlap, which allows them to be correctly assembled to give the sequence of the larger insert clones. Enough overlapping small-insert clones are usually se-quenced to ensure that the entire genome is sequenced several times. Finally, the whole genome is assembled by putting together the sequences of all overlapping contigs (Figure 19.11). Often, gaps still exist in the genome map that must be filled in by using other methods. Whole-genome shotgun sequencing The second approach to genome sequencing does not map and assemble the large-insert clones. In this approach, called whole-genome shotgun sequencing (I Figure 19.12), small-insert clones are prepared directly from genomic DNA and sequenced. Powerful computer programs then assemble the entire genome by examining overlap among the small-insert clones. The requirement for overlap means that most of the genome will be sequenced multiple (often from 10 to 15) times. Sequencing a genome requires breaking it up into small overlapping fragments whose DNA sequences can be determined in a sequencing reaction. The sequences can be ordered into the final genome sequence by a map-based approach (large fragments are ordered with the use of genetic and physical maps) or by whole-genome shotgun sequencing (overlap between the sequences of small fragments is compared by computers). W These large-insert clones are analyzed for markers or overlapping restriction sites,.